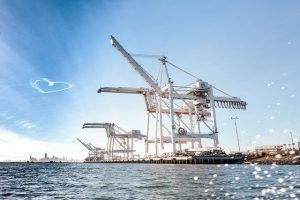 Oakland, Calif. – March 12, 2018: The Port of Oakland released a new 5-year strategic plan today that pairs business expansion with community benefits. Called “Growth with Care,” the plan envisions more jobs and economic stimulus as the Port grows. • An emphasis on sustainability to minimize the environmental impact of growth. According to the strategic plan, Oakland cargo volume should reach 2.6 million 20-foot containers by 2022. The Port’s Oakland International Airport is expected to serve 14-to-15 million passengers annually by then. Both would be all-time highs for Oakland. Growing business volume should lead to more hiring, the Port said. The Port added that it would prioritize local residents in filling jobs. The strategic plan calls for 8 percent more containerized cargo volume in Oakland by 2022. Airport passenger traffic should increase between 12 and 20 percent in the same timeframe, according to the plan. The plan envisions cargo growth from two capital projects at the seaport. The first is a 283,000-square-foot refrigerated distribution center called Cool Port Oakland that opens this summer. Another 440,000-square-foot distribution center is planned at a nearby Seaport Logistics Complex. At the Airport, Oakland’s growth strategy is predicated on more flights – whether domestic or international. Target destinations over the next five years include New York, Boston, Washington, D.C., Asia, Canada and South America. The Port’s third business – Commercial Real Estate – will concentrate on maintaining high occupancy rates, according to the strategic plan. It will also support residential development planned in the Port’s Jack London Square neighborhood. A centerpiece of the strategic plan will be curbing diesel emissions, the Port said. According to Port data, truck emissions are down 98 percent since 2009 while vessel emissions have declined 76 percent. The strategic plan commits the Port to an overall reduction of 85 percent by 2020.